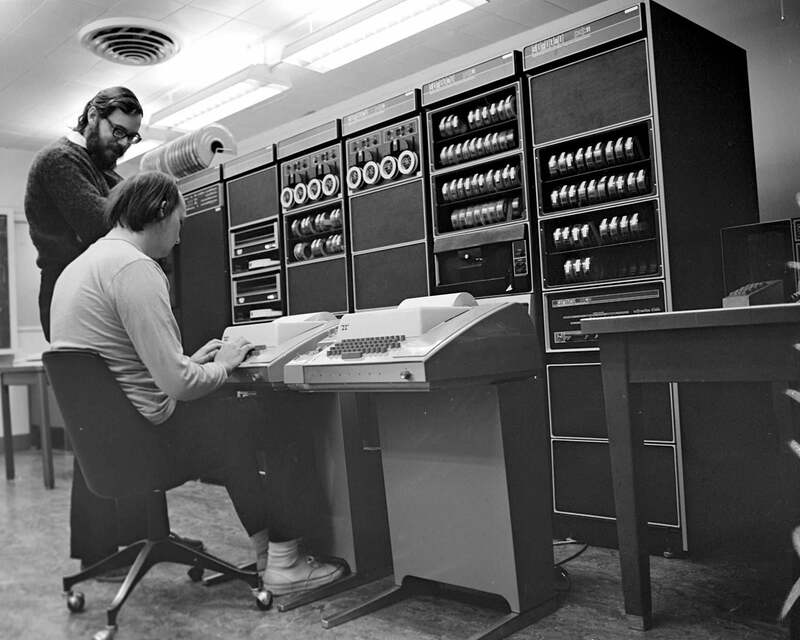 Ken Thompson (sitting) and Dennis Ritchie at PDP-11. Thompson designed and implemented the original Unix operating system, which is still today, the backbone of the internet. What is "The Cloud"? A brief explanation and history of cloud computing. Cloud is a term we hear everyday, so let's talk about what it is and why it rocks! Any data or services not stored or processed locally on a personal computer or server. You can see why the terminology is confusing because this literally means everything you access on the internet is in the cloud, which technically, is true. In fact, as the consumer based internet was kicking off in the 1990s, telecommunication companies were using the cloud symbol to represent the internet when explaining their Virtual Private Network services. Since before the modern browser, companies have been using the cloud as a metaphor to describe the internet. So why is it only recently becoming status quo? To answer that, let's first learn about the non-cloud a.k.a. local intranets. A local server is simply a computer that is physically at the location you are accessing it from. It's less common now. As a consultant for a manufacturing sales rep business in the late 90s, I would work with a single on-site business server which handled serving their website, running business POP email, and managing all of their business data (mostly visual basics storing to ODBC database). What a nightmare this was. Fortunately most businesses do not practice this anymore and are relying more heavily on cloud solutions like website hosting and software services. Cloud solutions aren't perfect: providers could go out of business, long network outages will affect access, and services are exposed to the dangers of the internet. With that in mind, local servers still serve a purpose. For example, backing up business critical data, storing personally identifiable information (PII) that doesn't belong in the cloud, or local files sharing between employees. From local to "the Cloud"
In the early to mid 1990s getting a website on the internet meant running your own server at your business (local non-cloud solution) that had a connection to the internet with a T1 line tied to the main infrastructure. There wasn't much available for "hosting" services until the late of the 90s. To run a website off-location (in the cloud) the options were to host with your ISP (they provided email and web hosting) or go with an individual developer that typically charged a fee to host your website on a server they managed. Both of these options were better for the business. As the 90s continued more cloud services started to appear like Dreamhost for websites, loudcloud for infrastructure, and salesforce for data. Enter into the 2000s, hosting solutions became status quo for any website, and it's rare you find a business hosting their own website from a local server. Whether or not the solutions were advertised as "Cloud", the trend of businesses migrating their services off site into "the cloud" had begun. Cloud computing and the cloud are two very different things. Cloud computing can be simply explained as a network of computers working together to accomplish tasks. Even though the term cloud computing was popularized in the mid 2000s the actual methodology isn't new. Cloud computing has in fact been around since the early 1970s when computer processors were quite weak and expensive to create. Back then UCLA published NETRJS, a message protocol for queuing up remote jobs to offsite computers. It worked just like an internet browser... but with a typewriter. This is in 1971 remind you, two years after we landed on the moon. In the mid 2000s this concept became more popular as it was used to handle mass scale by the majority of the internet services you use everyday (Google, Netflix, Spotify, etc). It was popularized as a product service as well starting with Amazon Elastic Cloud Computing, Rackspace, and everything IBM markets. Computers today are insanely more powerful than they were when NTTRJS was released. To give you context, the smartphone in your pocket outranks super computers from the 70s and 80s when it comes to speed. This is all relative because the amount of people using the internet increases every day, and this growth is only sustained by computer processing power, thus cloud computing will always be necessary for large scale applications. Facebook users add 300 million new photos every day. Massive computing power and infrastructure is required to sustain this amount of usage. Without cloud computing, Facebook would cease to exist. Facebook has two data centers running thousands of computers working in conjunction (cloud computing) to support it's application usage. Eventually all software will migrate away from your computer into the cloud; that is possible because of cloud computing. As this trend continues people will become less reliant on native software and will have access to services from any device (laptop, watch, phone, you name it).